I love buying lots of vegetables from our vege stallholders in both markets. I get sucked in by how good they look, how fresh they are and consequently buy without too much planning. It means that by the end of every weekend our fridge is full and Mike says ‘how are we going to eat all that’. Somehow every week we get through it. So this week’s recipes are two very easy vegetable dishes using what I bought last weekend. Both work as accompaniments to simply cooked meat, chicken or fish. No need to be particular with quantities here. Heat the oven to 180°C. Wrap the beetroot in foil and place on a baking dish. Roast till just soft – this could take at least an hour (alternatively boil them – it’s quicker but I think you lose some intensity of flavour). After about 20-30 minutes, place the carrots on foil on another baking dish, drizzle with a little olive oil and salt and pepper. Loosley close the foil to make a package. Cook in the oven for 20 minutes or so. Open the package and drizzle over some pomegranate molasses (or good quality balsamic vinegar). Leave the foil open and cook till the carrots are caramelised. Once the beetroot are cooked, cool till you can handle them, and then peel and slice each into wedges. 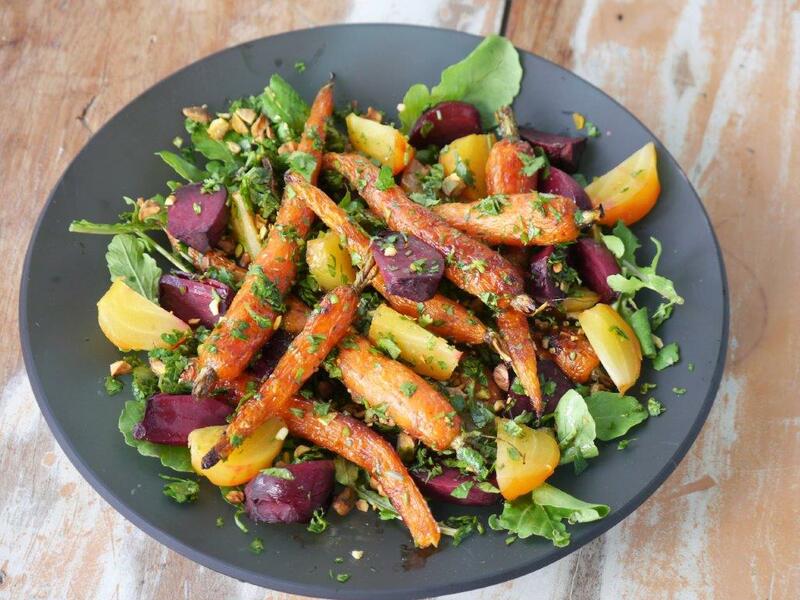 Place rocket on a serving platter then add the beetroot and carrots. Sprinkle over the herbs and pistachios and drizzle with the dressing. I like this with the veges served warm or at room temperature. Heat a little olive oil in a frying pan. Add the garlic, cook for a minute (careful you don’t burn it). Add the cauliflower florets, season and leave for 3-4 minutes. Add a splash or two of water, cover and turn down the heat. Cook for about 5-10 minutes until nearly ready now still a little crunchy. Take the cover off for the last minute so any remaining moisture evaporates. 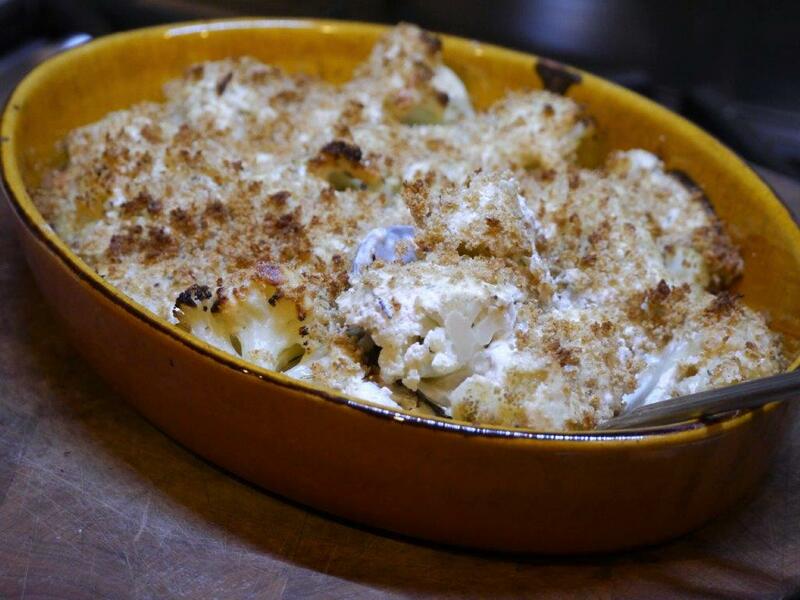 Place the cauliflower in a shallow baking dish and sprinkle with some of the thyme leaves and pepper. Mix together the goats cheese, milk, cayenne and most of the thyme leaves. Drizzle this all over the cauliflower, sprinkle with as many breadcrumbs as you like and bake in the oven till the crumbs are browned (about 20 minutes).